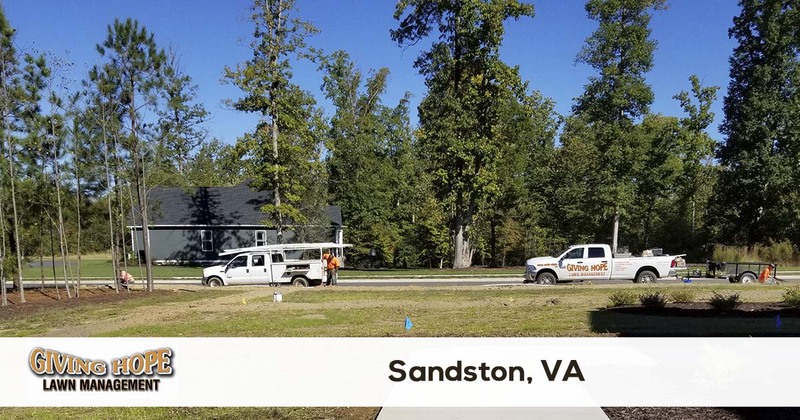 Giving Hope Lawn Management is proud to serve the community of Sandston with professional lawn care and landscaping services. For more information or to get a free quote call us today at 804-839-8340. The town of Sandston, VA, has a unique past. It began as just a place for military families to live during World War I. But today, it’s a thriving community of people who love living near the Virginia coast. But in many ways, it still doesn’t feel like a real city yet. For instance, finding a dedicated Sandston lawn care remains a challenge. How can you find quality landscaping at affordable pricing? When you call Giving Hope Lawn Management, you’re hiring the most reliable choice around for all your yard care needs. We offer lawn mowing, mulch installation, troubleshooting for irrigation systems, and more! Since 2011, we’ve remained the affordable choice for complete landscaping services. When you need to save on a greener, healthier, lawn, you can always rely on us for the best results! Our team has what you need to complete any project you’re planning. Whether you’re looking for a redesigned yard or just need to know you’re getting better monthly care, we do it all! Stop spending a fortune on landscaping companies that don’t do more than cut grass. Instead, enjoy complete yard care solutions at affordable pricing for even advanced service options! Choose the affordable team of expert landscaping professionals. We do what other companies can’t! If you’re ready to start seeing results from your lawn care company, then it’s time to call us. We offer only the best yard care solutions at the lowest pricing possible every day. Giving Hope Lawn Management is the industry leader for lawn care and landscaping in Sandston. We offer a 100% satisfaction guarantee with all of our services, so there is no risk for you to give us a try. Give us a call today for the fastest service at 804-839-8340.